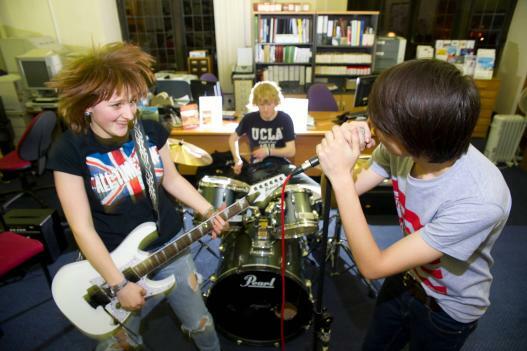 Skipton Rewind Songwriting Club is the result of a partnership project between NYCC Libraries, NYCC CYC (Connecting Youth Cultures), 4 Youth, and North Yorkshire Music Action Zone (NYMAZ). The group meets at Skipton Library every Tuesday evening 4.15-6.15 (during term time) and is open to any young person aged 12-19. Rewind was initially conceived as a self-contained set of ten weekly songwriting workshops to culminate in a showcase performance of the young peoples' work. Part of a wider Songwriting in Libraries initiative and facilitated by the coming together of the three agencies Rewind continues to grow and change to meet the needs of the young people we work with. Through the weekly session young people were invited to meet at the Library each week to develop their songwriting skills with Library staff, 4 Youth staff and a professional musician. The group has now evolved so that sessions are partly songwriting, partly events planning and partly youth work and support. There was a great enthusiasm within the group to continue meeting and so the three services again worked together to provide more music provision, a place to work and the equipment for more sessions with a view to building a bigger, better Rewind. The group rallied and networked to build the number of attendees, planned a larger concert, designed posters, promoted it online and off, booked a number of independent artists and bands, organised all the technical requirements, navigated Health and Safety, dressed the venue and performed their work. To date the group have organised and delivered 6 events for other young people, and the ticket sales raise funds help to pay for more sessions with the musician. The young people have also applied successfully to external bodies including O2 Think Big for additional funding to help to develop and sustain the group. The young people take an active leadership role in the direction of the group, they have become involved in other projects such as the Cultureshock Festival, and Tea-P in the Park in partnership with Craven Youth Council, they have developed a network with other young songwriters from across North Yorkshire and are very visible in Skipton through their work. Rewind Skipton Songwriters won the CILIP Libraries Change Lives Award in 2012. Some of the young people travelled to the Houses of Parliament to be presented with the award by Minister for Culture Ed Vaisey. "songwriting has transformed me into a far more confident and secure person, i feel like a have a place to go every week where i feel completely accepted. the library is an excellent and safe place for us to meet, it is full of inspiration and help from all of the books and computer access, which is extremely useful. the library offers so much: CDs, books, internet, a great space and most importantly really friendly library staff whom i feel totally comfortable with. songwriting has changed my life for the better, and i am so so happy that i was told about it, i don't know where i'd be without having the opportunity to meet at the library every week." "The songwriting workshop was brilliant and has inspired us to write our own songs. With Rich being there with the guitar, it brings our songs alive so they are no longer words on a sheet of paper. Being able to perform makes you feel like you're part of a special community that everyone can relate to and also it helps boost your confidence being able to sing and perform to a small crowd."